Vermillion Incorporated has designed improved communication cables for the C-130 and KC-135 aircrafts that eliminate the need for on-site manufacturing, increase performance and decrease mean time between failures. 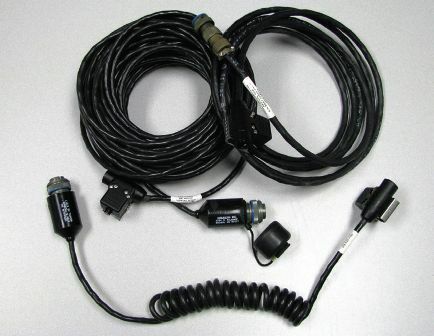 The Vermillion communication cable utilizes our Vermalloy® shielding technology for improved EMI/RFI. This technology is currently utilized within multiple airborne platforms with an outstanding track record for both EMI & RFI protection. We have also improved the durability of our cables by upgrading the outer jacketing material and thickness. The improved jacketing will allow the cables to withstand more of the everyday “use and abuse”. This is especially true of the longer cables that see ramp and tarmac contact. In addition, Vermillion has designed an overmolding area behind the circular connector. This overmolding will allow the cable to be recoiled without damaging the rear of the connector and eliminate any strain issues from the recoiling action. Vermillion also provides an optional cap to completely enclose the circular connector from the front and back for additional connector protection. Order them directly with your Government Purchase Card.